What are the volatile Black Seed Oil Reactions within the Human Body? The blessed seed has a different content of volatile black seed oil depending on the hybrid of seed and the area that it is grown. In analysis the blessed seed oil may have a content between 0 to 4.6% of volatile oil. The black seed oil varies also in taste. The black mild oil has a less pungent taste (1.2% volatile oil content). It is the volatile oil that creates the pungency in the taste. For those of us who do not like the taste then this is the oil to try. If the pungency is still a problem then the other options are capsules or the blessed seed honey mix. While nigella sativa oil has been used for nearly 4000 years it is only in the last century that mankind has been able to study how it works. During the last twenty years (1992-2012) there has been extensive study on the pharmacological actions of the blessed seed. A great deal of the studies dealt with the volatile black seed oil and its major constituents. These studies revealed a multi-range of actions that covered almost all known ailments of man in the various body systems. It contain most of the anti-oxidant, anti-inflammatory, anti-microbial, anti-fungal, anti-tumour, and immune-enhancing activity. The analysis of the volatile black seed oil reveals chemical compounds that have been proven to exert all of these actions. Cymene: Generally used for its local analgesic actions, in rheumatic conditions. Pinene: When taken has mild expectorant and colic properties and when used externally has similar actions to Cymene. Limonene: Reported to be effective in the treatment of gallstones. Nigellon semohiprepinon: When inhaled or rubbed on the chest, it enlarges the bronchi, dissolves cramps. It raises their temperature and alleviates symptoms due to bronchial asthma and whooping cough. Also inhibits the release of histamine. 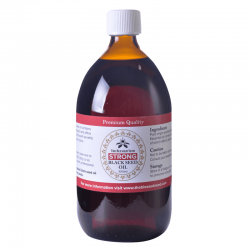 Thymoquinone: Inhibits infection, relieves pain, stimulates the gall bladder and works as an anti oxidant. 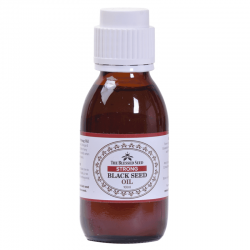 The volatile black seed oil has been scientifically proven to lower blood pressure. The spread of multidrug-resistant strains of fungus and the reduced number of drugs available made it necessary to discover new classes of antifungals and compounds that inhibit these resistant viruses. The volatile oil of the blessed seed performed a broad spectrum of antibacterial and antifungal activities. The oil was also effective against multi-drug resistant strains of Staphylococcus aureus. There is an estimate of 20% of the human population are long-term carriers of S. aureus. S.aureus can cause a range of illnesses, from minor skin infections, such as pimples, impetigo (sores and blisters), boils (furuncles), cellulitis and folliculitis (skin inflammation), carbuncles, scalded skin syndrome, and abscesses, to life-threatening diseases such as pneumonia, meningitis, osteomyelitis, endocarditis, toxic shock syndrome (TSS), bacteremia, and blood poisoning(sepsis). The anti-fungal spectrum included Candida albicans and Microsporum gypseum (ringworm). The blessed seed is repeatedly recommended for further study due to the powerful results that researchers have found. The volatile black seed oil in the blessed seed has been scientifically proven to protect against ulcers by approximately 38%. It has also helped with indigestion and reduce fat. In most Asian countries Nigella Sativa seeds and it’s oil are commonly used for the treatment of asthma. The volatile oil in the blessed seed has proven to be an excellent protective agent. It is used for both bronchial asthma and asthmatic bronchitis and has proved to be more effective in children than adults. Researchers in Berlin found that the respiratory effects of black cumin seed oil is beneficial for allergic diseases. There was a study of 152 patients with allergic diseases. Those who received black seed oil in capsules, experienced fewer allergic symptoms compared with those who received a placebo. This study was published in the journal “Phytotherapy Research” in December 2003.Based on the results of this study, research indicates that black seed oil could be an effective therapy for allergic diseases. Investigators from Kyushu University in Japan report that black seed oil might be helpful in preventing conjunctivitis, abscesses, parasites and other infections. These antibacterial, antifungal and antiviral roles have attributed to the essential oil of the seed. Japanese researchers also showed that in vivo treatment with the blessed seed oil induces a strong antiviral effect against murine cytomegalovirus. Congenital cytomegalovirus (CMV) infection is the most common congenital viral infection in humans, and the major nonhereditary cause of central nervous system (CNS) developmental disorders. At Xi’an Jiaotong University School of Medicine in China examined the immunomodulatory activity of the blessed seed oil in experimental models of allergic airway inflammation. The results of their experiments indicated that the blessed seed oil supplementation improves allergic airway inflammation. 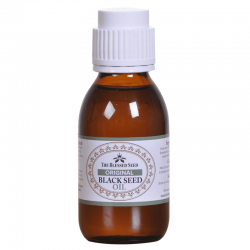 Black seed oil also helps reduce fever, by inducing perspiration which helps the body cool, and stimulates the release of toxins. Results of the volatile black seed oil significantly suppressed paw oedemas in rats. Administration of the volatile black seed oil to type 1 diabetes induced significant decreases (23-43%) in the blood glucose level without affecting insulin release. However, treatment of induced diabetes with the oil for 40 consecutive days resulted in a significant decrease in the blood glucose level, and an increase in the blood insulin level. Rats with induced colon cancer in the post initiation stage, but with daily treatment with the volatile black seed oil for 14 weeks induced significant reductions in the colonic lesions. The treatment did not induce any harmful effects in the blood or urine parameters and no pathological changes in the various vital body organs. Furthermore, exposure of various human cancer cell lines to the volatile black seed oil induced significant death of the cells showing clear cytotoxic effects. Thymoquinone has a general anti-tumor effect. Research also established that TQ exerted cytotoxicity against lungs, larynx, colon and pancreatic cancer, yet it was more potency against larynx cancer. 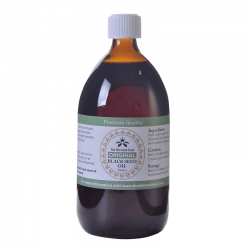 Studies using various isolated smooth muscles revealed a smooth-muscle relaxant activity of the oil. This has been shown in the isolated rabbit aorta, rabbit jejunum and the isolated guinea-pig trachea. The suggested mechanism was the blockade of calcium channels. Furthermore, the oil relaxed the uterine muscle of both rats and guinea-pigs and antagonized oxytocin-induced uterine contractions.